Atom and Bits, Libelium’s Serbian distributor, has participated between 15th and 19th of May in the 61st International Fair of Technics and Technical Achievements (UFI). The event is the most important economic and technological one in Serbia and the South East Europe and has got a great influence upon the future industrial development in the country and region. The technical fair is visited by tens of thousands of professional visitors, decision makers, investors and experts from technological and innovation sector. Atom and Bits has shown there some of Libelium smart solutions, Waspmote Plug & Sense! Smart Agriculture and Waspmote Plug & Sense! Smart Cities. These applications allows to control soil and ambient conditions in farms and crops and the last one monitors noise and air pollution and other environmental parameters. “Libelium sensor networks are cornerstone of Atoms and Bits end-to-end IoT solutions. Due to the wide portfolio of sensors and sensor nodes, as well as integration with leading IoT platforms, Libelium enables us to develop industry and customer specific IoT solutions. By utilizing Libelium technology, we can apply agile approach to customer project and have more time for fulfilling customer specific business requirements”, has stated Dejan Damnjanović, co-founder of AtomsAndBits. 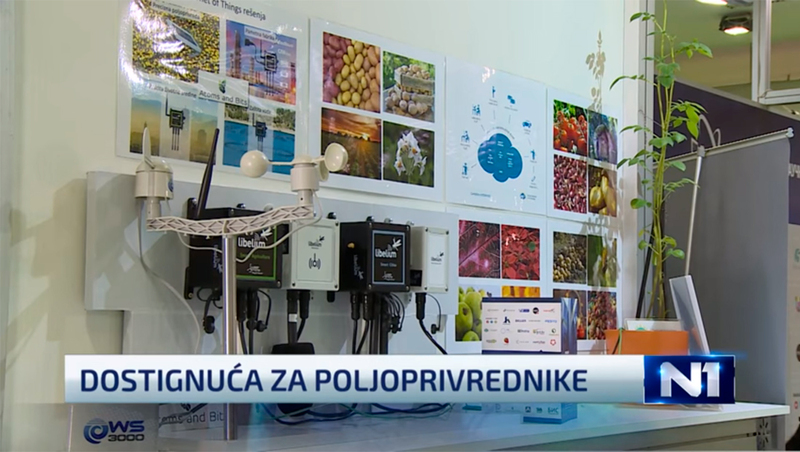 N1, one of the most important news channel in Serbia, has broadcast a report about the 61st International Fair of Technics and Technical Achievements (UFI) and Atom and Bits participation there. Discover it from 33:09. If you want to join our IoT Ecosystem or want more information about it, contact Libelium Sales Department.